Ganesh Himal region lies towards the north of Kathmandu Valley. 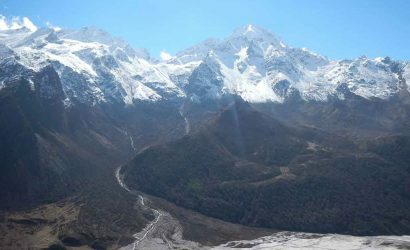 The Ganesh Himal Ruby Valley trek offers the spectacular views, untouched and wild natural beauty passing through the dense forest and meadows with small villages and the unspoiled Tamang culture. The mountain got its name after the elephant-headed Hindu God of Fortune-Ganesh. Ganesh Himal is a sub-range of the Himalayan mountain range consisting of several peaks over 7,000 meters with uninhabited foothills running down to the south and west. The Ganesh Himal range peaks (Ganesh I, Ganesh II, Ganesh III and Ganesh IV) form the ‘Great Himalayan Chain’ together. 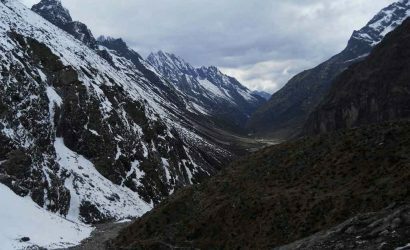 This great Himalayan massif stands between the valley of Budi Gandaki in the west and Bhote Koshi in the east. Ganesh Himal can also be seen from Kathmandu during the clear sky. The Ganesh Himal and Ruby Valley trek route is reachable within an easy access from Kathmandu. 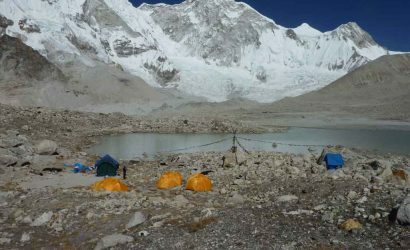 This trail receives lots of interest from foreign trekkers although it is not as popular as Annapurna and Everest region. The Sing la pass (4,545m/14,912ft) offers an excellent view of the massif Ganesh Himal, Langtang and Annapurna from its top. In March and April, the mountainsides are red due to the magnificent rhododendron blooms. The Ganesh Himal trek is now available with home-staying facility for a period of one to three weeks. 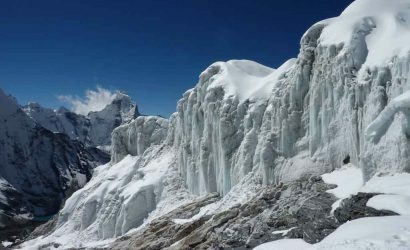 Here we offer an itinerary including the Ganesh Himal exploration trip with three passes, three lakes and finally Ruby Valley. Drive (72km) from Kathmandu to Trishuli Bazaar and trek to Salangkhu Khola (550m/1,804ft). Trek Salangkhu Khola to Bhalche Village (1,850m/6,069ft). Trek Bhalche Village to Rupchet (2,850m/9,350ft). Trek Rupchet to Pang Sang Pass (3,850m/12,631ft) crossing over Sing La Pass (4,545m/14,912ft). Trek Pang Sang Pass to Chalish Gaon (1,674m/5,492ft). Trek Chalish Gaon to Gomba Danda (2,402m/7,880ft). 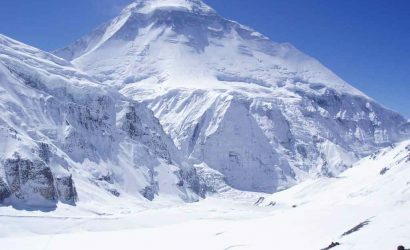 Trek Gomba Danda to Thulo Dhunga (3,337m/10,948ft). Trek Thulo Dhunga to Nojet Kharka (3,691m/12,110ft). Rest day at Nojet Kharka (View Point) for exploration and acclimatization. Trek Nojet Kharka to Kharka (3,900m/12,795ft). Trek Kharka to Ganesh Kunda (3,500m/11,483ft). This is a Ruby area. Trek Ganesh Kunda to Tatopani (1,250m/4,101ft). Enjoy with Natural Hot spring. Trek Tatopani to Lapa Gaon (1,850m/6,069ft). Trek Lapa Gaon to Magne Goth (2,950m/9,678ft) crossing over Magne Goth Pass (2,936m/9,633ft). Trek Magne Goth to Dunchet Village (1,519m/4,983ft). Trek Dunchet Village to Budigandaki. Trek Budigandaki to Arughat Bazaar. Drive from Arughat (Gorkha) to Kathmandu.